It has been very hot and dry here in Southern Illinois and since this is a farming community everyone is concerned about the poor status of the new corn and soy bean crops. The local newspaper said today that this is the driest that it has been here since the 1930s. As I write this (on Thursday night), there is thunder, lightning, and rain outside. It sounds like music to me. Nothing in this world lasts forever—good or bad. And speaking of lasting, I have been watching the Ogo Wireless Messaging device with great interest. 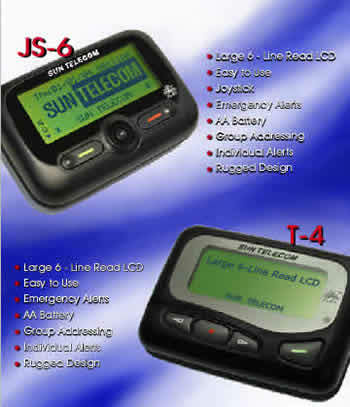 It is a lot like a two-way pager except that it operates on cellular frequencies. I wondered if it would be successful—because of all the reasons that we had used in promoting two-way Paging. Well, it looks like it didn't make it. This product was launched recently by AT&T Wireless, but after they were acquired by Cingular, the decision was make to kill it. Details follow in a couple of news articles. Ogo no go w/o voice. I was sorry to see this happen. The hottest new service on the Internet is Podcasting. In other words, Podcasting is like thousands of "radio stations" on the Internet, except that the programs are all pre-recorded. Almost everything we listen to on regular on-the-air radio broadcasts is pre-recorded as well. These recordings can be received on any type of computer (not just Apple) using free software and they are relatively easy to record and publish. So my question is, how many readers would be interested in listening to a weekly Podcast supplement to this newsletter? It would include commentaries (by yours truly) and interviews with various industry leaders and news makers using Skype and the regular telephone — along with a little music. If there is enough interest, I will look into this possibility. Glenayre T8500 PAs tested and guaranteed $200.00 each. WHY PAY $400 TO $600 TO GET THEM REPAIRED??? Satellite Uplink Services Available–Completely redundant. We will uplink your paging data to two separate satellites for complete redundancy. Be prepared in the event of another satellite failure! Several AAPC representatives just returned from participating in the annual Association of TeleServices International (ATSI) in St. Louis, Missouri. This was an excellent opportunity to gain exposure for AAPC, promote the benefits of the paging industry, and solicit a few new members. AAPC’s web site, www.pagingcarriers.org, is about to get a new look and updated content! In addition, there will be a members only section that will allow AAPC members access to legal/regulatory updates, PTC information, and association news. Work on the web site will be beginning in the next couple of weeks. If you have suggestions, please forward them to info@pagingcarriers.org. AAPC is in the final stages of finding an excellent site to host their fall event in early November in Phoenix, Arizona. Stay tuned for the grand announcement for the exact location in the next couple of weeks! Members—Do you have a new product you would like to feature or share in the newsletter? We want to help you promote your company, please submit content to info@pagingcarriers.org. 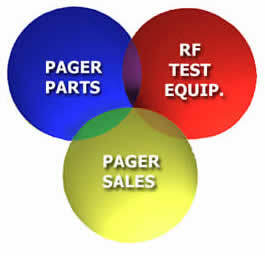 AAPC working with you to advance your business and the paging industry! Thanks to the Silver Vendor! 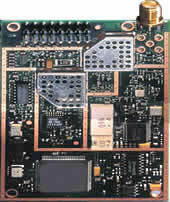 The Hark ISI-400LX is a hardware device that encapsulates serial data into TCP/IP for transmission over the Internet. It can also be configured to convert incoming TAP messages from the serial port and send them over the Internet to Paging providers in e-mail (SMTP) or Simple Network Paging Protocol (SNPP) format. The ISI-400LX with the optional external modem can connect to a secondary dial-up ISP when a failure on the ethernet port is detected. BOSTON—Customers of XM Satellite Radio Inc. aren't the only ones who appreciate its digital quality and nationwide coverage. The U.S. military might draft XM's service for homeland security purposes. XM and Raytheon Co. have jointly built a communications system that would use XM's satellites to relay information to soldiers and emergency responders during a crisis. The Mobile Enhanced Situational Awareness Network, known as MESA, would get a dedicated channel on XM's satellites that would be accessible only on devices given to emergency personnel. The receivers would be the same as the portable ones available to consumers, with slight modifications to make them more rugged. The military often leases transmission space on commercial satellites, but this collaboration between a massive defense contractor and a fun-loving radio network — XM's first two satellites were dubbed "Rock" and "Roll," and its next two might be "Rhythm" and "Blues" — is unusual. It began last year when engineers with Waltham, Mass.-based Raytheon Co. were looking for an inexpensive system that would help emergency responders and soldiers coordinate their actions after a natural disaster or terrorist strike. Existing communications systems for such scenarios can be bulky and expensive. Commercial satellite radio receivers, in contrast, are lightweight, battery-powered and cost as little as $99. Their digital transmissions have enough bandwidth to carry maps and other imagery, which would be displayed on portable computers that plug into the satellite receivers. And the system can be programmed to relay information just to specific devices if need be, so individual users can get messages appropriate to their regions. While XM's service only reaches North America, Raytheon has signed on with Worldspace Corp., a satellite radio provider in Africa, Asia and Europe, for global coverage. That system debuted in March during tsunami relief efforts in Asia, when Raytheon and Worldspace gave satellite receivers to aid agencies to coordinate their activities, said Mike Fleenor, the MESA program manager at Raytheon. Even before that, MESA's domestic potential had attracted the interest of officials at U.S. Northern Command in Colorado Springs, Colo., which is responsible for homeland security missions. That got MESA included in this month's Coalition Warrior Interoperability Demonstration, an annual event in which technology vendors show their wares to U.S. and allied military brass around the world. During test runs at the event, images, data and audio were sent to an "injection point" at Washington, D.C.-based XM. The transmissions were relayed to space and then sent back to the portable devices that would be carried by personnel in the field. Official assessments of MESA and other technologies shown at the demo will take months, and procurement decisions will likely come next year. But early reviews of MESA were favorable, said Christopher Lambert, Northern Command's deputy program manager for the demonstration. Lambert said he could envision the system being useful not only for disasters but also for everyday police uses. For example, an undercover cop could have the system in his car, masked as a regular XM radio most of the time, but ready to receive messages from headquarters with the flip of a switch. Though XM's selling point is its 130 nearly commercial-free channels of music, sports, news, talk, traffic and weather, it has waded into public service before. XM and rival Sirius Satellite Radio Holdings Inc. each have a channel reserved for emergency broadcasts and carry Amber Alerts for missing children. After hurricanes ravaged Florida last year, XM and Sirius donated free receivers so people could get weather updates. XM spokesman Chance Patterson said it's too early to say how much revenue MESA could bring the company, which has nearly 4 million subscribers but has struggled to become profitable. XM lost $642 million last year. "It would easily pay for itself," he said. Liverpool, UK—7 June 2005: A scientist at the University of Liverpool has helped to create the world's smallest transistor—by proving that a single molecule can power electric circuits. Dr Werner Hofer, from the University’s Surface Science Research Centre, is one of an international team of scientists who have created a prototype that demonstrates a single charged atom on a silicon surface can regulate the conductivity of a nearby molecule. Computers and other technology based on this concept would require much less energy to power, would produce much less heat, and run much faster. Currently, most electronic devices are based on silicon. There is, however, a limit to how many transistors can be packed into a given volume of silicon as the currents in these transistors are high and can overheat. By miniaturizing a transistor, the time during which an electron can pass through it is reduced and therefore the device can be operated with much higher frequencies and take up much less space. 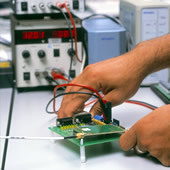 Dr Hofer, a theorist, who worked in collaboration with colleagues from the National Institute for Nanotechnology of the National Research Council in Canada and the University of Alberta, provided the theoretical background in an experiment to examine the potential for electrical transistors on a much smaller, molecular scale. Their findings have been published in the journal, Nature. Molecules are extremely small, on the scale of a nanometre (one billionth of a metre). The team tested the transistor potential of a molecule by using the electrostatic field emanating from a single atom to regulate the conductivity of a molecule, allowing an electric current to flow through the molecule. These effects were easily observed at room temperature, in contrast to previous molecular experiments that had to be conducted at temperatures close to absolute zero, and with much smaller current amplification. Dr Hofer explains: “Our experiments demonstrate that we can control the current through a single molecule by charging a single atom on a silicon surface, while all surrounding atoms remain neutral. 1. The University of Liverpool is one of the UK's leading research institutions. It attracts collaborative and contract research commissions from a wide range of national and international organisations valued at more that £90 million annually. Density contour of a dangling bond on silicon. If one hydrogen atom is removed, the free electron of the dangling bond leads to a very local negative charge at the silicon atom. A single molecule transistor, image courtesy of the National Research Council, Canada. WASHINGTON—The Supreme Court gave the entertainment industry a new legal weapon for fighting Internet privacy, ruling today that Web companies that encourage computer users to download free copies of music or movies can be held liable for the industry's losses. The 9-0 ruling may be the most important copyright decision of the Internet era. The justices firmly rejected the view that computer companies and software makers have a right to freely share copyrighted music and movies online. Instead, they said these companies are guilty of violating the copyright laws if they make a business out of helping others make free copies of protected works. The decision is a major victory for the Hollywood studios and the recording industry. Its lawyers said the entertainment industry was suffering "multibillion-dollar harm" from the free downloading of music and movies. The high court threw out an appeals court ruling in California that had shielded some of these Internet companies from being sued for copyright infringement. "By unanimously upholding the rights of creators, the Supreme Court has defended an environment for legal online music services to thrive," the National Academy of Recording Arts & Sciences said in a statement. Meanwhile, in a second Internet-related decision, the justices held that cable TV companies that offer broadband access to the Internet may close their lines to outside competitors. When the Internet began, most users reached the Web by dialing over a phone line. Subscribers had a choice of providers, including independents such as EarthLink and small firms such as Brand X based in Santa Monica. But the Federal Communications Commission ruled that cable companies need not operate their lines as common carriers, and the high court upheld that rule today. Consumer activists said the decision would give computer users few, if any choices, when they subscribe to broadband service. 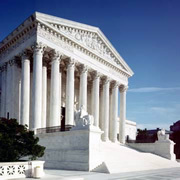 The file-sharing case has been closely watched by the entertainment and computer industries. Today's decision overturns a ruling by the U.S. 9th Circuit Court of Appeals, based in San Francisco, which said that websites that offer "peer to peer" sharing of computer files cannot be sued for copyright violation because they are not making or selling illegal copies themselves. The peer to peer software allows users to tap into the computers of others in order to obtain a music file. Disagreeing with the 9th Circuit, the Supreme Court said that Web companies that "induce" others to steal copyrighted material are violating the Copyright Act. "There is substantial evidence ... of inducement" against Grokster and StreamCast, the two file-sharing companies that were sued by the entertainment industry, said Justice David H. Souter. It was a mistake for the appeals court to dismiss the lawsuit against these companies, he added. Moreover, if found guilty of inducing copyright violations, Grokster and StreamCast can be held liable "for the unlawful acts of others," he said. Testimony in the case showed that tens of millions of computer users tapped into file-sharing networks with the aim of obtaining free copies of music or movies. Today's decision is not the end of the road, however. It gives industry lawyers a legal basis for suing file-sharing networks and urging that they be shut down as illegal operations. Six years ago, Napster created the first network that enabled users to download music from other people's computers through the Internet, becoming wildly popular. Users tapped into a central computer index to find songs on others' PCs. But Napster was sued for copyright infringement and put out of business by the federal courts in California. The developers at Grokster and StreamCast tried a different approach: Neither has a central computer index. Instead, the software enables users' computers to compile their own indexes and build networks. Because the owners of Grokster and StreamCast don't monitor or control the downloading of copyrighted files, a federal judge in Los Angeles and the U.S. 9th Circuit Court of Appeals rejected a copyright infringement claim against them. In its ruling, the 9th Circuit relied heavily on a 1984 ruling of the U.S. Supreme Court that upheld as legal the Sony Betamax, which allowed users to make copies at home of copyrighted TV programs. The high court noted that the Betamax could be used for legal purposes, such as copying TV programs that were in the public domain. In the Grokster case, the 9th Circuit judges acknowledged that 90% of the songs copied on the file-sharing networks were downloaded illegally. But that meant a substantial number—as many as 10%—may have been copied legally. No. 1 U.S. cell phone operator Cingular Wireless has stopped selling the Ogo, a BlackBerry-like wireless handheld, but said on Thursday that it will continue to support the devices that have already been sold. The Ogo is a phone that doesn't make phone calls. Rather, it caters to an array of data-only services including text messaging, instant messaging and e-mailing. Cingular has given the Ogo a thumbs-down. The Ogo's fate at Cingular underscores the dominance of the Treo, BlackBerry and Sidekick, similar kinds of higher-end wireless devices that cater to mobile professionals and the young and hip. In a now infamous episode, someone hacked the Sidekick of celebrity heiress Paris Hilton, then published an A-list of telephone numbers found on the handheld. The Ogo is a carryover from AT&T Wireless, which Cingular Wireless purchased for $41 billion a few months after AT&T Wireless introduced the $100 device. For another $18 monthly, subscribers got unlimited ingoing and outgoing messaging using e-mail and IM services from one of three providers: Yahoo, MSN or America Online. Customers could also get access to additional providers for $3 a month each. "As a data-only device, the Ogo does not fit into Cingular's handset strategy" of offering devices capable of both data applications and phone calling, Cingular said in a statement. While it became a no-go item for Cingular Wireless, the BlackBerry-like wireless messaging handheld known as the Ogo is getting ready for markets outside the United States, its manufacturer said during a recent interview. As previously reported, No. 1 U.S. cell phone operator Cingular has stopped selling the Ogo, although it will continue to support the devices that have already been sold with Cingular service plans. 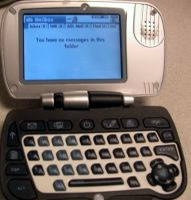 Because it is a data-only device, the Ogo didn't fit into Cingular's product strategy, a company representative said. The Ogo is a phone that doesn't make phone calls. Rather, it handles an array of data-only services, including text messaging, instant messaging and e-mailing. Almost all Ogo owners seemed happy with the handheld, using it at least once a day, according to Ogo manufacturer IXI Mobile, based in Redwood City, Calif. 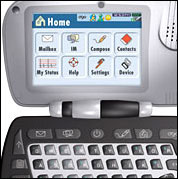 The Ogo's problems finding traction in the United States underscore the dominance of the Treo, BlackBerry and Sidekick--similar kinds of higher-end wireless devices that also function as phones and cater to mobile professionals and the young and hip. Tal Raeside, vice president of IXI Mobile, said not to count the Ogo out. It will be for sale in countries outside the United States in the next few months. In the meantime, the company is re-evaluating whether to take another stab at the United States, he added. From IXI's perspective, the Ogo may be a victim of Cingular's $41 billion takeover of AT&T Wireless. AT&T Wireless' launch of the Ogo took place just weeks before the merger was announced. Takeover rules prevented IXI from ever "really getting Cingular's perspective on this" before it was too late to do any good, Raeside said. The writing was already on the wall for this one: Cingular’s confirming that the Ogo is over. The data-only handheld messaging device never really caught on in the first place, and was all but orphaned after the the company’s merger with AT&T Wireless, which had originally introduced the device last year, but it wasn't until yesterday that Cingular finally made the Ogo’s obsolescence official, issuing a statement about how it didn't fit into the company’s current “handset strategy.” They’ll still service the ones they’ve already sold, but otherwise, it’s dead. Dear Brad, I very much enjoyed speaking with you last week and hope with the below items I can get rid of some inventory and you can make a few bucks. New inventory: 18 GHz all dishes Andrew HP.180E models P-6 were built in the US. are well constructed before Andrew decided to farm out their construction elsewhere. These are twice as heavy as the current econoline models, shown in catalog 34. We wish to sell the below items in lot and are priced FOB our shop Franklin Park IL. Note: although all items are new, some of the RF absorbers in the shrouds will need to be re-glued as they are loose from being moved. 8 ea. 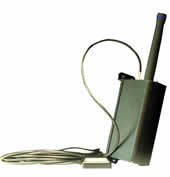 HP2-180E-2 foot, 18 GHz antennas with 9 ea. feed horns plus 8 ea. 200486, 2 foot mounts. 8 ea. HP2-180E 4 foot, 18 GHz antennas with 6 feed horns and 7 ea. 203622 mounts, there is only 1 ea. radome. 1 ea. Teglar, HP6-180 E 6-foot 18 GHz antenna with 2 feed horns. See attached photo of 2-foot dish mounted, we also have in inventory 3 ea. dish tripod mounts for building mounts for heavier dishes. Value on above items, Andrew catalog 34-$45,450.00, we are asking $22,725.00. We also have 2 ea. 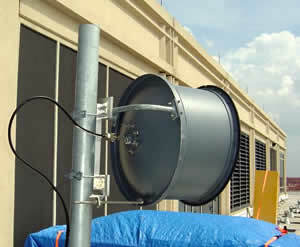 6-foot, 5.8 GHz unlicensed band, used top condition without mounts or radomes, $3,000.00 FOB our shop. Note: We have misc. 36 antennas, new or in excellent condition, antennas ranging from high band through 460-470 MHz, 800-900 MHz available on lot offer. 1 ea. 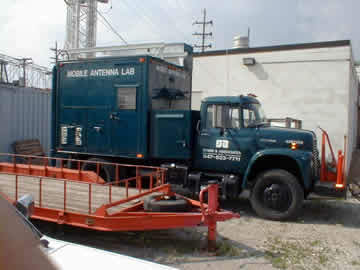 Radio Van/Mobile antenna lab, IH 1974 load star 1600 4x6-304 gasoline engine rebuilt in 2002. Has a 100 foot extendable tower which nests atop vehicle that can be swung back and electrically extended. 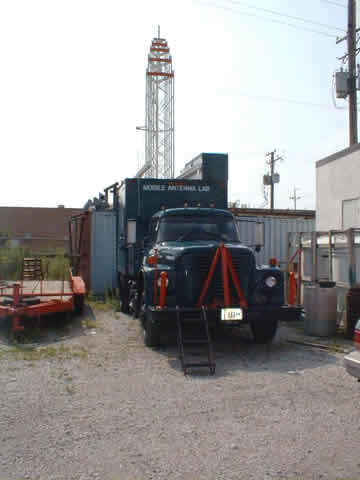 Has walk in box to set up radio equipment for testing and unit maintains small in unit generator for power. Unit has outriggers to stabilize while in operation. Asking $22,000.00. Our mobile data equipment includes a range of intelligent Mobile Data Terminals (MDTs) which may be interfaced to a variety of wireless networks including ReFlex, GPRS & CDMA cellular. Automatic Vehicle Location (AVL) and GPS solutions, Dispatch & Messaging software. We offer mobile communications dealers and systems integrators a “fast to market” job dispatch and job management capability with the inbuilt job processing system which may be interfaced to a variety of CAD & JMS platforms. Specialised local area paging systems, paging interception and message reprocessing software, field force automation and mobile dispatch solutions. We also do customized product development and export worldwide. Jack St. Clair Kilby passed away June 20, 2005, in Dallas following a brief battle with cancer. 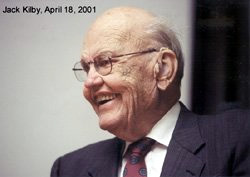 The Great Bend Foundation (Jack Kilby Statue Fund), P.O. Drawer E, Great Bend, Kansas 67530. DALLAS (June 21, 2005) – Jack St. Clair Kilby, retired TI engineer and inventor of the integrated circuit, died yesterday in Dallas following a brief battle with cancer. He was 81. Mr. Kilby invented the first monolithic integrated circuit, which laid the foundation for the field of modern microelectronics, moving the industry into a world of miniaturization and integration that continues today. He was awarded the Nobel Prize in Physics in 2000 for his role in the invention of the integrated circuit. A man of few words, Mr. Kilby is remembered fondly by friends and associates for being in every sense of the word a gentleman and a gentle man. At 6 foot 6 inches in height, he was occasionally called the “gentle giant” in the press. “Ever practical and low-key, with good humor and quiet grace, Jack was a man with every right to be boastful, yet never was,” said Mr. Engibous. Mr. Kilby was always quick to credit the thousands of engineers who followed him for their impact on growing the industry and changing the world. “For those of us who were fortunate enough to have known him, it’s that dual legacy for which I personally will always feel privileged to have known Jack – not only the quality of what he did, but the quality of who he was,” said Mr. Engibous. Mr. Kilby knew he wanted to be an engineer relatively early in life. When he was in high school, his father ran a small power company with customers scattered across the rural western part of Kansas. When a severe ice storm downed telephone and power lines, Mr. Kilby’s father worked with amateur radio operators to communicate with his customers. This event triggered the younger Kilby’s lifelong fascination with electronics. He pursued that interest at the University of Illinois. World War II interrupted his studies, when Mr. Kilby joined the Army. Following the war, he returned to the University of Illinois, completing his bachelor’s degree in electrical engineering in 1947. Upon graduation, he took a position with Centralab in Milwaukee, where he first worked with transistors, the building blocks for integrated circuits. While at Centralab, he pursued graduate studies in electrical engineering at the University of Wisconsin and received a master’s degree in 1950. Mr. Kilby moved to Dallas in 1958 to work for TI. As a new employee that summer, he was not yet entitled to the mass August vacation that was customary among TI employees at the time. It was in this relatively quiet time that the idea of the integrated circuit first came to Mr. Kilby. Mr. Kilby and TI officials put the circuit to the test September 12, 1958. It worked, and his invention transformed the industry. In 1960, the company announced the first chips for customer evaluation. Two years later, TI won its first major integrated circuit contract to design and build a family of 22 special circuits for the Minuteman missile. The integrated circuit remains at the heart of all electronics today. Mr. Kilby held several engineering management positions at TI between 1960 and 1968, when he was named assistant vice president. In 1970, he became director of engineering and technology for the Components Group before taking a leave of absence to become an independent consultant. Mr. Kilby officially retired from TI in 1983, but he continued to do consulting work with TI. He maintained a significant relationship with the company until his death. In addition to his TI career, Mr. Kilby held the rank of Distinguished Professor of Electrical Engineering at Texas A&M University from 1978 to 1984. In 1990, he lent his name to The Kilby Awards Foundation, which commemorates “the power of one individual to make a significant impact on society.” Its international awards program honors exceptional individuals for their contributions to society through science, technology, innovation, invention and education. Mr. Kilby considered himself first and foremost an engineer, a profession he viewed as transforming ideas into practical realities. He held more than 60 patents for a variety of electronics inventions. Among these were the handheld electronic calculator and the thermal printer, both of which he co-invented. In addition to the Nobel Prize, Mr. Kilby received numerous honors and awards for his contributions to science, technology and the electronics industry. He is one of only 13 Americans to receive both the National Medal of Science and the National Medal of Technology, the highest technical awards given by the U.S. government. In 1993, he was awarded the Kyoto Prize in Advanced Technology. Mr. Kilby also received the first international Charles Stark Draper Prize, the world’s top engineering award, from the National Academy of Engineering in 1989. In addition, he is honored in the U.S. Patent and Trademark Office’s National Inventors Hall of Fame, celebrating individuals whose ideas have changed the world. Mr. Kilby was the recipient of honorary degrees from several institutions of higher learning including the University of Miami, the Rochester Institute of Technology, the University of Illinois, Southern Methodist University, Texas A&M University and the Georgia Institute of Technology. Mr. Kilby leaves his family – daughters Janet Kilby Cameron of Palisade, Colorado, and Ann Kilby of Austin, Texas; five granddaughters, Caitlan, Marcy and Gwen Cameron of Palisade, Colorado, and Erica and Katrina (Katie) Venhuizen of Austin; and son-in-law Thomas Cameron – and friends, colleagues and admirers throughout the company, the industry and the world. His wife, Barbara Annegers Kilby, and sister, Jane Kilby, preceded him in death. More information will be posted on the TI web site (www.ti.com/kilby) as arrangements are finalized by the family. (June 22, 2005)—Jack Kilby, who held the call sign W9GTY in the 1930s and `40s, died in Dallas June 20 at age 81. He was awarded the Nobel Prize in Physics in 2000 for the invention of the first monolithic integrated circuit. "As a boy, Kilby used to travel the western half of the state with his father in the summers, checking on various power plants in the family's 1935 Buick. When a severe ice storm crippled Western Kansas in 1937, Kilby and his Dad borrowed a neighbor's ham radio to communicate with the various power plants around the state. Kilby became interested in ham radio, and got his license from the FCC, with his own set of call letters—W9GTY." ARRL HQ staff member Chuck Skolaut, K0BOG, recalled: "[He] was my hometown's claim to a famous person. He was sometimes known as `Mr IC.' I remember the first time I heard about the big blizzard and how his father communicated with other people in the area with help from his ham friends. That got Jack interested in ham radio." Following college and a stint in the Army, Kilby went to work on the transistor for Centralab in Milwaukee. In 1958, he moved to Dallas to work for Texas Instruments, where he came upon the idea of creating the integrated circuit. By 1960 the first chips were made available to industry, and the age of microelectonics was upon us. The vanity call sign W9GTY is today held by the J. S. Kilby Digital Millenium, based at the US Naval Postgraduate School, Monterey, California. All Cards guaranteed to work. More available, call or e-mail with your needs. The recent popularity of Skype has pushed Taiwan's developers to release a new crop of VoIP (voice-over-Internet protocol) hardware such as handsets, speaker phones, and hands-free devices. These developers are betting that early development Skype and other VoIP devices will translate into huge profit as the Internet telephony market takes off. VoIP sends calls made on ordinary phones over the Internet, as opposed to regular phone lines, allowing for drastically lower rates and new features. The technology, which has been steadily improving over the last decade, has evolved to the point where traditional telecom companies - which are often state monopolies - are now deploying VoIP on a large scale. The arrival and popularity of Skype, however, has sparked a hardware development bonanza for VoIP accessories. Skype is an Internet VoIP phone service that allows Skype users to make free phone calls to other Skype users. Skype claims to offer better sound quality than the usual 300-3000Hz range of normal phones - although the specifics of Skype's wideband Codec have not been officially revealed. Skype itself operates through an interface similar to MSN Messenger, in layout and features, and is available in versions for Windows, Mac and Linux. One of the best-selling Skype accessories is the DualPhone by Olympia. The DualPhone functions as a land-line cordless phone but can hook up to Skype at the touch of a button. The DualPhone seems to be the most expensive Skype accessory on the market. The basestation is sold for about US$180, while the handset is about US$90. The DualPhone uses DECT, the European cordless telephony standard. It plugs into a PC via a USB port to enable the Skype phone calling features. The big difference is that with the DualPhone, the user presses one button to alternate between a land or Skype connection. Taiwan-based companies such as Jazz Hipster Corp, Netronix Inc, and Ortek Technology Corp are marketing Skype-enabled hardware in order to capitalize on the Skype craze. The three basic ways to use Skype are headsets, USB phones and USB to RJ11 devices, which allow users to send and receive both Skype and PSTN calls from a single device. Just about any equipment that can plug into the audio and microphone jack of a PC could be used with Skype. As such, most hardware developers market their products as VoIP accessories, rather than catering exclusively to Skype. Networking vendor Netronix has just released a USB VoIP hands-free talking device that functions as a hands-free speaker phone, a speed dialer, and a portable speaker. 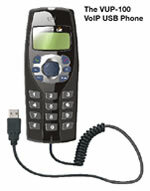 The unit comes with echo cancellation technology and two on- and off-hook buttons for quick call answer and termination. According to Netronix, the unit will retail for US$40-US$50. Jazz Hipster, a digital audio speaker specialist, has rolled out a Skype speakerphone. The Bzcom J1302 desktop microphone has a built-in speaker, suitable for Skype or any other VoIP application. Bzcom began shipping in May. Measuring 10(W) x 17(H) x 12(D) cm, the Bzcom J1302 is a compact unit featuring one microphone (built into the base), two 1.75-inch full-range speakers (located on each side of the device), one USB connector and one headphone jack. Jazz also provides a user guide and a utility CD. There is no power adapter for the Bzcom J1302, as it is powered through USB. The USB cable also serves as the audio connector to the PC. The unit retails for around US$10-$15. Ortek has released a corded USB phone designed specifically for Skype. 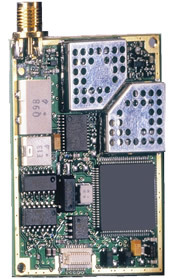 The VUP-100 (see Fig) connects to a computer through a USB interface, allowing a user to make and receive free PC-to-PC calls as well as chat through the VoIP-enabled phone. The VUP-100 is compatible with Microsoft Windows 2000/XP and is driver-free. The phone has digital audio features for phone-like communication, and allows subscribers to control Skype through its keypad. The company declined to state how much the VUP-100 sells for, stating that the final street price depends on volume. OVERLAND PARK, Kan., and ARLINGTON HEIGHTS, Ill., June 30 /PRNewswire/—Sprint has entered into an agreement with Motorola to conduct joint wireless broadband technology testing and equipment trials in 2005 and 2006 to help substantiate next-generation wireless network infrastructure requirements and consumer products for future wireless interactive multimedia services. The collaboration will spur IEEE 802.16e (2.5 GHz) technology development, validate vendor solutions and help formulate network architecture strategies. The technical assessment involves lab testing of base station equipment, smart antenna technology and multimedia handsets and field trials in certain locations beginning in 2005 through 2006 as a basis for additional business- case evaluation. Successful outcomes will lead to customer demonstrations and further user studies for market applicability. "Sprint is fostering a number of strategic partnerships and investigating multiple technologies in support of future wireless interactive multimedia services," explained Oliver Valente, chief technology officer and vice president - Technology Development, Sprint. "WiMAX is one of the technologies Sprint is investigating for services which would be considered for deployment in the 2.5 GHz band of spectrum." "Motorola will use its deep heritage in wireless radio technology innovation, IP core switching and wireless devices to help Sprint validate next-generation wireless opportunities," said Dan Coombes, senior vice president and chief technology officer for Motorola Networks. Sprint previously signed a related agreement with Intel as it begins to cultivate an ecosystem of chipsets, devices, equipment and infrastructure for future wireless broadband services. Sprint has provided broadband wireless (BRS) service in the past and continues to investigate potential offerings of interest to the marketplace. In January, Sprint joined the WiMAX Forum as a principal member to lend its support and long-standing network expertise to that organization's mission of global interoperability standards formation for broadband wireless access products. Sprint offers an extensive range of innovative communication products and solutions, including global IP, wireless, local and multiproduct bundles. A Fortune 100 company with more than $27 billion in annual revenues in 2004, Sprint is widely recognized for developing, engineering and deploying state- of-the-art network technologies, including the United States' first nationwide all-digital, fiber-optic network; an award-winning Tier 1 Internet backbone; and one of the largest 100-percent digital, nationwide wireless networks in the United States. For more information, visit http://www.sprint.com/mr. Motorola is a Fortune 100 global communications leader that provides seamless mobility products and solutions across broadband, embedded systems and wireless networks. In your home, auto, workplace and all spaces in-between, seamless mobility means you can reach the people, things and information you need, anywhere, anytime. Seamless mobility harnesses the power of technology convergence and enables smarter, faster, cost-effective and flexible communication. Motorola has sales of US $31.3 billion in 2004. For more information visit: http://www.motorola.com/. I want to wish all the readers here in the USA, a happy fourth of July (Independence Day) and every one else a happy weekend. Please be careful if you are traveling, so you can be back here again next week. If you would like to help support the newsletter with advertising, please click here for more information about the different advertising packages that are available. If you can't take out an ad, please help by getting a couple of your friends to sign up for free subscriptions. Oh yes, don't forget to let me know what you think about a Podcast supplement to the newsletter.